How Far is Harmony's Mithila? 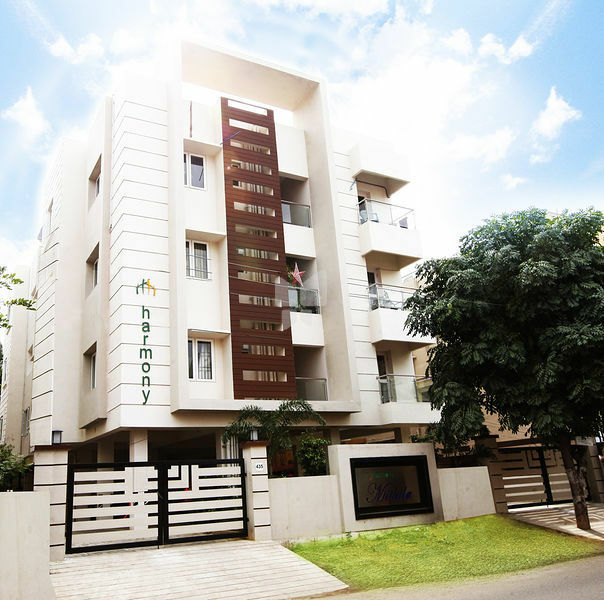 Harmony Residences Pvt Ltd new residential project Mithila is one of the popular residential developments Located at K K Nagar Chennai.Harmony Residences Pvt Ltd Mithila offers 3BHK luxurious apartments with all modern amenities. RCC Framed structure with high quality chamber brick walls for external and internal partitions, plastered and finished with cement paints externally and with plastic emulsion internally. Putty and emulsion paints for the walls and ceilings with white cement paint. Wardrobe space with slabs and lofts in bedrooms and kitchen. Vitrified tiles of Kajaria/Johnson make or equivalent of size 2x2 for all areas except bath rooms which will have anti skid ceramic flooring. Polished teak wood door for main entrance with grilled gate for extra safety and security. All internal doors will be provided with teak wood frames. Flush doors for internal doors, water resistant doors for toilets and all doors with good quality locks. UPVC Casement windows with complete with steel grills wherever necessary. Polished granite slab for kitchen platform fixed with single bowl stainless steel sink with drain board. Coloured western style WC in all bathrooms. 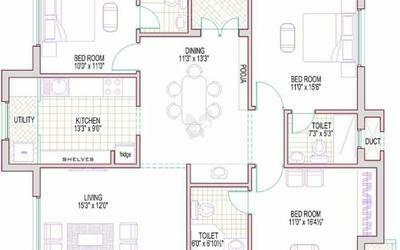 Bathroom fixtures will be from Parryware/Hindustan or equivalent. Colour designed glazed tiles for the wall dado for full height of wall. Suitable colour matching tile for the flooring with good quality sanitary fixtures. Tiles will be of Johnson/Kajaria make or equivalent. Geyser provision with hot and cold piping with high quality chrome plated pipe fitting. CP fittings to be of parryware make or equivalent. Coloured wash basin in three toilets. Deep bore well for ground water with Underground sump for both metro water and ground water. One Elevator Johnson or equivalent will be installed. Multi-core high quality copper wiring in concealed PVC conduits with MCB and recessed switches. High Voltage Circuit for AC, Geyser, Fridge etc., and low voltage circuits for other points wherever required. Modular Switches to be provided of Anchor/Siemens or equivalent. As per the table shown below. Watchman kiosk and common toilet. Interlocking pavers of reputed make. Telephone lines with Broadband connectivity. Harmony’s promoters with nearly two decades of extensive Real Estate Development experience bring their expertise to focus on every aspect of the project. In simple words, everything from precision engineering to aesthetic design, fast track execution process right down to high-class interiors is done in-house. This allows for stringent quality control - which in turn gives our customers a fine combination of precision and aesthetics.We believe our buildings should reflect engineering excellence with a view to providing complete customer satisfaction. It is our intention that the quality of our products and services should result in complete value for our clients and thus fostering continuous demand for our products.The combination of prime location, aesthetic appeal, functional design, and optimum use of space and excellence of construction with an affordable price is the hallmark of Harmony’s “VALUE FOR MONEY" proposition.